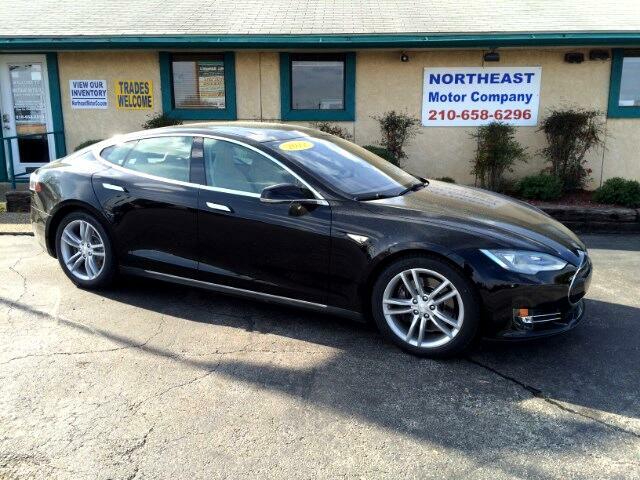 2012 Tesla Model S SIGNATURE, P85, LOADED!!! At Northeast Motor Company, we have the knowledge and experience to insure that your first (or next) Tesla Purchase is as confident and comfortable a purchase as possible. We've been providing Tesla automobiles to the Greater San Antonio area and across the nation for many years so rest assured that we are the right choice for you. Our 2012 Tesla Model S Signature is opulently equipped with the P85 Performance Option, Technology Package, Panoramic Sunroof, Supercharger Enabled, Twin Chargers, Lighting Group, Smart Air Suspension, Power Windows/Locks/Mirrors, Navigation, Backup Camera, Alcantera Headliner, Suede Trimmed Leather Seats, Steering Wheel Mounted Audio Controls, Bluetooth, Cruise Control, Power Telescopic Tilt Steering Wheel, Heated Seats, Dual Zone Climate Control, Power Adjustable Front Seats, Traction Control, New Michelins !, and MORE!!! We are incredibly well versed in the Tesla automobile line and can give you all the answers you're looking for in your pursuit of next generation motoring. Call or come out today to inquire about our easy financing options and many available extended warranties. Message: Thought you might be interested in this 2012 Tesla Model S.